Susan van Rooyen and Moe Kekana of King James Group were behind the 2-Minute Shower Song project. Sanlam's idea was to make a billboard telling people to cut down on water use. 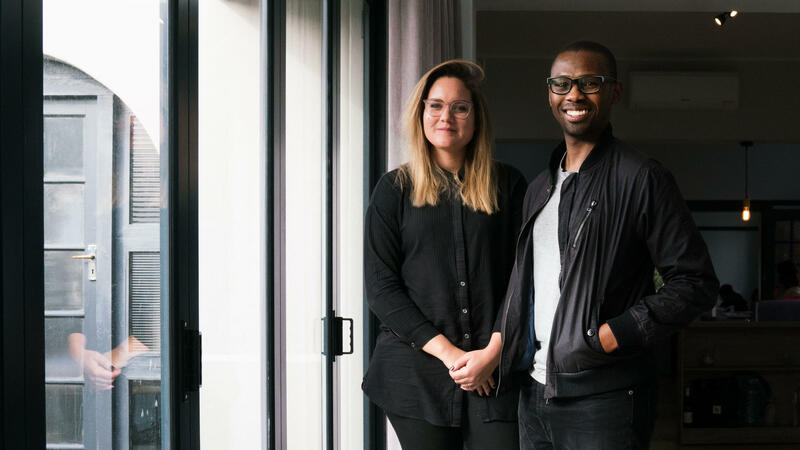 But that seemed boring to copywriter Susan van Rooyen and art director Moe Kekana. They're with the King James Group, the communications firm that Sanlam pitched. So van Rooyen and Kekana started brainstorming. Cape Town's government was asking people to save water by taking showers that lasted two minutes or less. Inspiration struck soon enough. "What do people do in the shower?" says 30-year-old van Rooyen. "They sing." She and Kekana, 28, came up with something of a musical challenge: the 2-Minute Shower Songs campaign. The team asked South Africa's biggest pop stars to record new, shortened versions of their most famous songs. "I remember sending an email where somebody said, 'How many do you want?' And I said, 'I could live with four or five, but 10 would be the dream,'" Kekana says. "And we got 10." The South African artists who contributed to the project range from pop singer Jimmy Nevis and rapper Youngsta to rock band Desmond & The Tutus. Once everyone was on board, the songs were recorded within two weeks in November 2017. "We basically created an album in under a month," van Rooyen says. The idea of 2-Minute Shower Songs is fairly simple: You hit play as you jump in the shower, sing along and finish by the time the song ends. The 10 songs span an array of genres — from chill house to heavy drum-and-bass — and translate the sense of urgency around the drought into the music. In June — after the city cut down on water usage by more than half — Cape Town officials proclaimed that "Day Zero" had been averted. The term refers to the day it was predicted the city would have had to turn off its taps and distribute rationed water. Pop stars aren't exactly superheroes. But during this water crisis, everyone had a role to play. "Sometimes you don't know what you can do to help within a crisis," van Rooyen says, "and they were doing what they do best."